Make dressing for work a little easier – and a little more fun. When I started working in an office a few years back, one thing I struggled with was dressing for work. I had a clear idea of who I was, style-wise: I had a wardrobe that fit well, looked nice on me, expressed who I was, and was functional for my everyday tasks (walking across campus, working in the studio, etc). But working was a different beast, and I found myself struggling to translate my casual style to my work style. But here’s the thing I discovered – your work style and your casual style don’t have to be the same – they don’t even have to be similar, if you don’t want them to be. (And honestly, what could be more fun than having two wardrobes?) 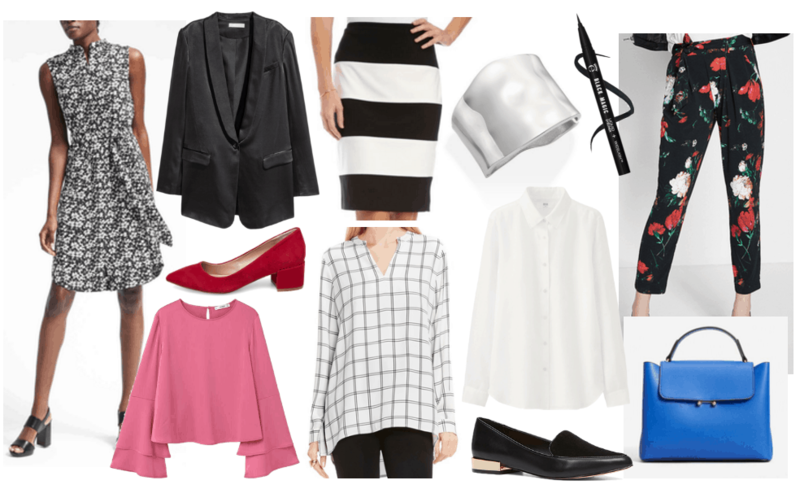 Having a separate “work” style has made it easier for me to shop for myself, extend the life of my wardrobe, and look more stylish and polished at work. One thing that helped me to nail down my “work style” was to write down the things I liked wearing that were appropriate for work and looked nice on me, and then write down a quick and dirty phrase that described those pieces and how they interacted with each other. 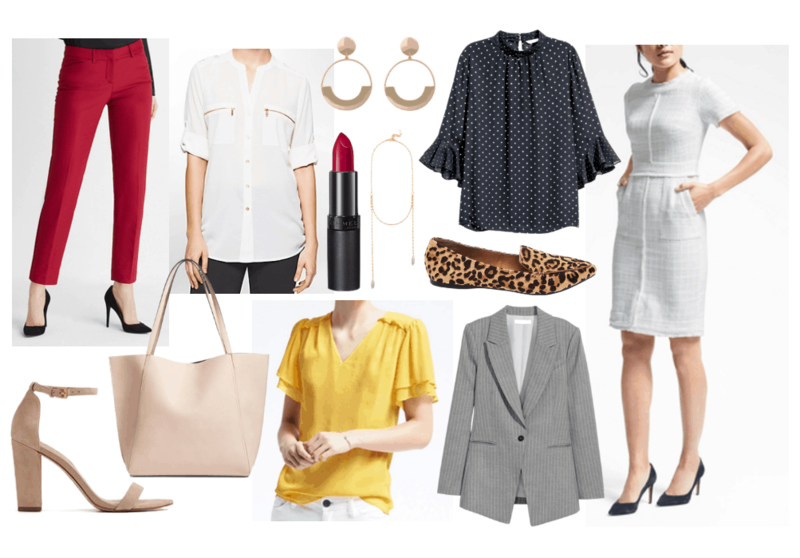 Using this method, I’ve created a couple of “work styles” based on what’s been trendy in the last couple of seasons and the specific work-wear needs of certain industries and offices. These, of course, will need personal touches to make them your own and to meet the needs of your role and your workplace. However, these work wardrobe style guides are a great place to start. Some trendy silhouettes, ultra-girly colors, and certain prints can read as unprofessional in more conservative sectors, like business, finance, or law. For a look that’s feminine but buttoned-up, look for well-tailored pieces that accentuate your favorite features (like the waist-cinching white sheath dress above) in classic colors like red, gray, navy, blush, and white, and classic or minimal jewelry in gold. Small, familiar, and neutral prints, like polka dots, pinstripes, and animal prints (in small doses) will help to mix up your look without drawing too much attention. 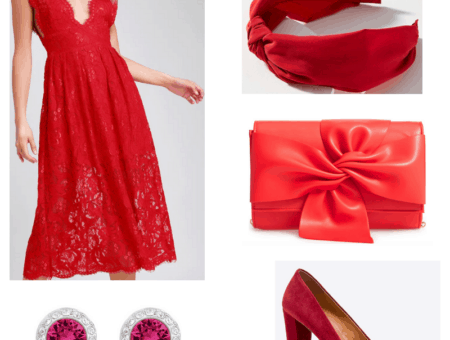 This style is also good if you like trying out trends related to silhouettes and colors. Yellow, which is posed to be the color this spring, works well with this look, while ruffled sleeves add a modern, romantic twist to otherwise plain blouses. 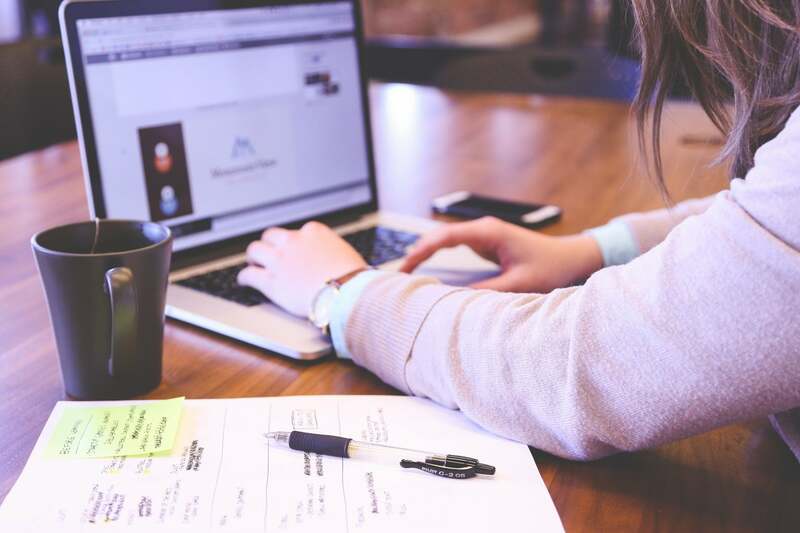 For ladies working in creative industries, like design, advertising, and publishing, having a creative, unique, and polished style is almost important as having a killer portfolio. This style doesn’t shy away from color, bold prints, or texture, but sticks to a mostly cool and black and white palette to allow for mixing and matching when appropriate. Look for pieces in bright, saturated colors – like red, pink, cobalt, yellow, or chartreuse – and printed pieces that are grounded in black and white, like the wrap dress above, along with solid neutral pieces you can wear with anything, like a white blouse and a black blazer. 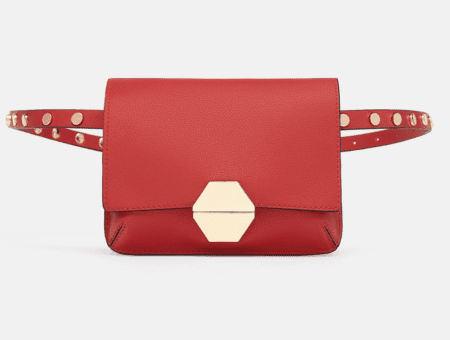 Eye-catching accessories also do a lot of work here, bringing a creative punch to otherwise neutral outfits, like red heels in a trendy silhouette, a bold blue bag, or an unexpected textured silver cuff. 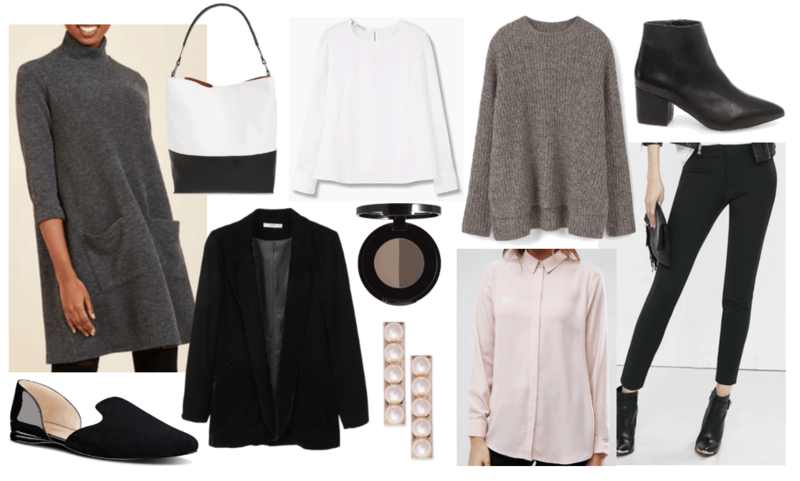 Ladies working in more relaxed offices and industries (think tech or start-ups) can get away with more relaxed and comfortable silhouettes that still play well with business wear for important meetings or client interaction. Sticking to a mostly neutral palette allows for plenty of mixing and matching but can be a little boring, so textural pieces, from a velvet blazer to slinky button-ups to nubby sweaters, play an important role in adding a little extra visual interest. The neutral palette of this look gives you a low-key canvas to try ultra-cool trends, like soft pastel colors, metallics, edgy pearl jewelry, or bold brows. How would you describe your work wardrobe? Would you wear any of these looks? Let me know in the comments below!